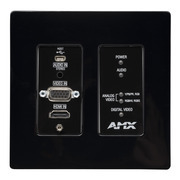 The AMX SVSI N2300 series encoders and decoder distribute stunning 4K visual quality with low latency, low bandwidth consumption, and low power consumption - all at an extremely competitive price. Perfect for casinos, bars and restaurants, hotel spaces, and anyplace video can enhance the guest experience. Need to add video displays to a ballroom? Run video to temporary lobby kiosks? No problem. The N2300 is perfect for reconfigurable spaces. Simply run a standard category cable, add a decoder, and access video from the network. Expand without replacing infrastructure. With the N2300, simply add an encoder to each additional video source and a decoder to each additional video display or projector. So go ahead, add as many displays as you want for the big game. Enterprise grade features like Power over Ethernet, LocalPlay, HostPlay, HDMI 2.0/HDCP 2.2 support, and the ability to easily adjust bandwidth and resolution to precisely meet the needs of the application; along with AES128 encryption makes it clear that our products are designed with the enterprise network in mind.